2015 Volkswagen Jetta available to order now | What Car? The face-lifted Volkswagen Jetta made its debut at the New York Motor show back in April. With VW announcing that order books have opened ahead of the new car arriving in UK dealerships in December 2014, we decided to take a further look. VW has given the Jetta a light makeover, with a restyled grille as well as changes to the front and rear bumpers. A new bootlid design now incorporates an aerodynamic lip that runs into the rear wings and revised tail-lights. Inside, the changes extend to new seats, doors and centre console trims, plus a new steering wheel and different instruments. 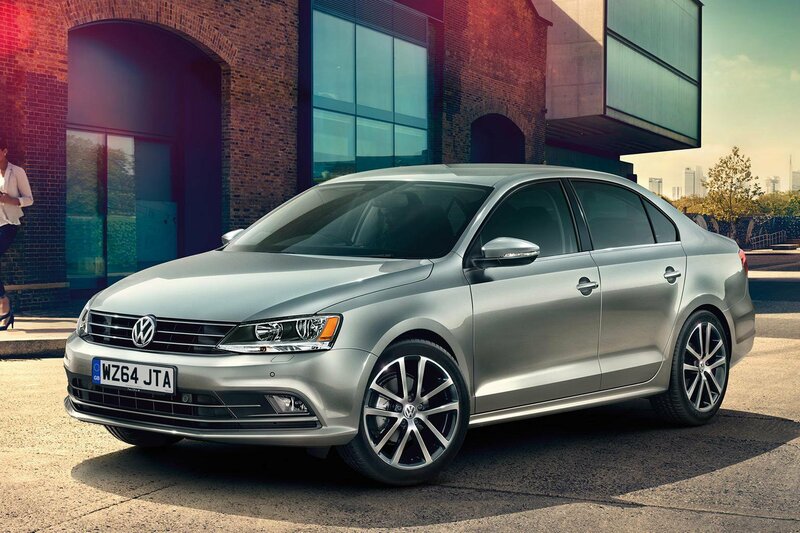 The Jetta offers a package that almost stands alone in the UK. VW claims that it bridges the gap between the Golf and the Passat in terms of size and price. Elsewhere, the Seat Toledo and Skoda Rapid are both much cheaper and rival the Jetta for interior space. In terms of price equivalents, models like the BMW 1 Series and the Audi A1 Sportback both feature variants in the £18,000-£25,000 bracket and offer a more premium package, but are not as practical as the Jetta. VW has dropped the 1.6-litre diesel engine that was available in previous Jetta, leaving buyers a choice of only two capacities - a 1.4-litre TSI petrol or a 2.0-litre TDI diesel - although two power outputs are available for each. In its lowest state of tune, the 1.4-litre petrol has 123bhp and will average 52.3mpg with emissions of 125 g/km of CO2 when fitted with the six-speed manual gearbox. The more powerful engine has 148bhp and if fitted with the six-speed manual 'box will average 53.3mpg and emit 123 g/km of CO2. With the optional seven-speed DSG fitted this changes to 55.4mpg and 117 g/km of CO2. Outputs for the 2.0-litre diesel are either 109bhp or 148bhp. The lower power version will average 67.3mpg with the standard five-speed manual, with CO2 emissions of 105 g/km (70.6mpg and 109 g/km for the seven-speed DSG). Meanwhile the higher output version averages 67.3mpg and emits 109 g/km of CO2 coupled with the six-speed manual (62.8mpg and 120 g/km for the six-speed DSG). All engines will be Euro6 emissions compliant. All new Jettas will come with engine stop-start and battery regeneration technology. S versions come with DAB digital radio, electronic stability control, electric windows, and air-conditioning. SE models get 16-inch alloy wheels, lumbar support for the front seats, Bluetooth and MP3 connectivity, a leather-trimmed multifunction steering wheel, and cruise control. GT trim offers enhancements such as larger 17-inch alloy wheels, sports suspension, front foglights, front sports seats, automatic headlights and wipers, an auto-dimming rear-view mirror, heat-insulating tinted rear windows, a colour multifunction trip computer, a driver alert system, and ambient interior lighting. Options for all models will include blind spot detection and rear traffic alert systems. Prices start from £18,815 for the 123bhp 1.4-litre TSI manual in S trim, rising to £24,715 for the 148bhp 2.0-litre TDI DSG auto in GT specification. VW dealers were happy to offer discounts of between eight and 10% on the previous Jetta and it is highly likely similar deals will be available on the new version.